Introducing our newly renovated, discrete, state-of-the-art Salon! Tiffany’s for Men has moved! We are in the same building, but have shifted into a brand new space. This new area has been totally designed with the comfort, privacy and amenities that today’s male client expects and deserves. Feel free to show up a little early for your appointment and relax in our comfortable leather chairs. News, sports, weather (sorry no soap operas) are available on our flat screen TVs. A wide selection of current men’s magazines is always on hand. Liquid refreshment as well as an assortment of nuts and snacks will comfort you during your visit. 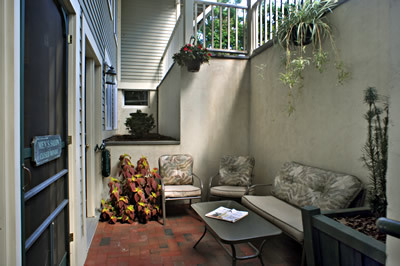 If you would like to enjoy a cigar, we have a pleasant outdoor patio where smoking is allowed. As you can see, our goal is to make your visit to Tiffany’s for Men a small escape from the demands of your schedule - a small oasis of calm and relaxation. While at the same time, you will be receiving the state of the art styling services that Tiffany’s for Men has been known for, for over 35 years.